Klinge Corporation manufactures temperature-controlled refrigerated and freezer cold chain containers for the pharmaceutical industry. The company’s variety of transport solutions ensures the safety of pharmaceuticals by preventing temperature deviations. As a leading manufacturer, Klinge Corporation recognises the precise requirements of the industry and its products reduce associated risks. Its portfolio ranges from ISO containers maintaining temperatures between -60°C and 20°C, to global system for mobile communications (GSM) remote temperature monitoring systems and dataloggers. Klinge Corporation’s Dual Refrigeration systems feature two reefer units, with an automatic switchover. This back-up and primary set-up ensures products are kept at the required temperature, even in an emergency. The company also present the option for one or two generator sets for extra back-up power. The units are also compact, meaning there is a maximum cargo space. For complete protection of cold chain supplies, Klinge Corporation offers two full-capacity freezer systems, the ultra-low temperature container and the Blast Freezer Unit. The full-capacity freezer unit maintains temperatures between 0ºC and -60ºC and prevents defrost heat from entering the cargo area. This design also stops decreasing of defrost efficiency, which can occur in more standard units. This system is also equipped with hot-gas defrosting and has options of having back-up power. Another available system, the Blast Freezer Unit, maintains temperatures of up to -60°C but is designed for quick-freezing. It uses an evaporator fan and adjustable ceiling to quickly lower temperatures and is often used for high-value seafood and meat, as well as for quickly freezing phase change materials. According to some sources, temperature excursions occur in 1%-5% of transport events, which makes cold chain one of the most vulnerable pharmaceutical processes. Klinge Corporation tackles the risks of transport with its Dual Refrigeration or Single temperature-controlled containers, back-up power, and temperature recorder. Klinge Corporation’s cold chain containers are available with GSM Remote Monitoring, which provides data on ambient and cargo temperature, the location of the shipment, and whether the alarm and power are on or off. The Dual GSM or SAT back-up can also be monitored, with all data accessible on the specifically designed satellite communication website. Temperature recorders are also available to provide evidence of correct temperatures for every trip as a delivery ticket or as a numerical or graphical printout. All data is stored with a date and time stamp in a large flash memory drive. Data will not be lost if the power supply is disrupted or disconnected. The real time clock is powered by an internal back-up battery. Klinge Corporation offers customised designs, which are robust alternatives to standard mass-produced containers. The company has been delivering cold chain transportation solutions for more than 30 years to leading pharmaceutical and chemical companies worldwide. Klinge Corporation was founded in 1984 as a spin-off of the Transport Refrigeration Equipment department of York International. It has maintained and built on the high standards set by York International, while constantly expanding its range of products. Klinge Corporation has announced it exhibited at the Cold Chain Global, a key event in the pharmaceutical supply chain industry. The biopharmaceutical cold chain sourcebook is a leading resource to the pharmaceutical industry. Klinge Corporation produces two products, which can allow the freezing and thawing of pharmaceutical cargo quickly. 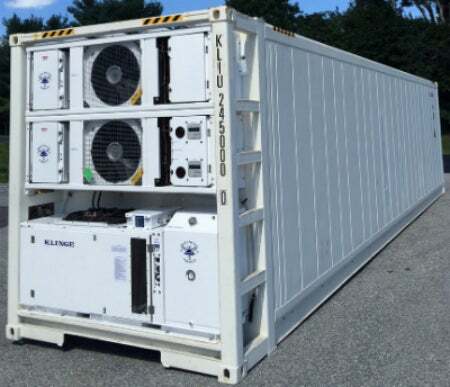 Klinge's Duel Refrigersation System ISO Container includes two reefer units. The system can switch to back-up emergency power to protect cargo automatically, which is essential for the transportation of valuable, temperature sensitive, or hazardous products. Klinge Corporation offers two complete and independent freezer systems, which keep valuable pharmaceuticals safe with both a primary and back-up unit. Klinge Corporation's Split and Dual Split-System Deep Freezer Containers are designed for mounting in customer's built-in rooms or on standard insulated containers. The company provides effective and efficient freezer units for storage and shipping. Klinge Corp's Ultra-low Temperature ISO Storage Container is a complete cold-chain solution. Klinge Corp has announced it will be attending the Intermodal Europe event, an exhibition and conference for companies associated with the container and intermodal industries. Klinge Corporation has long been known for its proven solutions in the Dangerous Goods market, where specialised dual-redundant shipping containers keep products at the right temperature, avoiding potentially catastrophic failures, which could result in the loss of product, property and even human life. Klinge Corporation exhibited at the Global Cold Chain Exchange in July. Klinge Corporation has delivered its Container Blast Freezer Unit Model CBU-30 to the Ministry of Marine and Fisheries of Indonesia through PT Waisity Indonesia for the Fishermen Empowerment project. Klinge Corporation has served as a Bronze Sponsor of the World Trade Center Harrisburg's event Bringing the World to You. Later this month, Klinge Corporation will conduct a demonstration of its Global Monitoring System (GSM) remote monitoring system with optional satellite back-up at the Cold Chain Global Forum. Logipharma interviews Klinge Corporation's vice-president Allan Klinge to discuss important themes affecting pharmaceutical logistics. Klinge Corporation has announced it will proudly sponsor the 14th Annual Cold Chain GDP & Temperature Management Logistics Global Forum, which will present 850 temperature-controlled life science leaders.